I promise I’ll try to keep my nerding out about football to a minimum here. I promise. But there are three things I need to bring to your attention. And finally, in light of Iowa’s continued dominance in the annual Cyhawk game, I would like to note that one of Iowa’s offensive linemen– Josh Koeppel – was HIT BY A TRUCK on 8/30 but played in Saturday’s game. I’m not sure if this is a testament to Kirk Ferentz’s faith that Koeppel was ready to play – or that Iowa State is just that bad. Fingers crossed that this post is wrong and the Hawks win on Saturday. 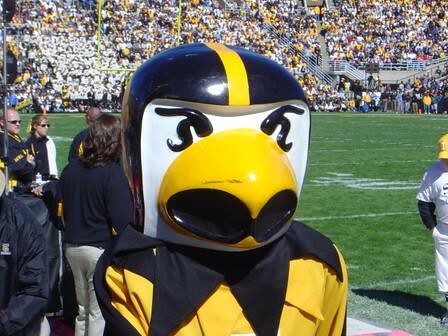 With Herky on their side, how could they not?